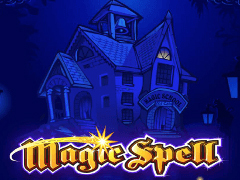 Anyone who has wanted to play an online pokie that features cats dressed as wizards has now got their wish granted, as Microgaming have released Magic Spell that combines moggies and magic in one game. For the rest of us, it’s still a fun game that’s got some cute symbols and a few bonus features, like wild wins, multiplier payouts and side games. Set in the Catskill Academy, that seems more than a little similar to Hogwarts, Magic Spell is populated by various student cats, a headmaster cat and a hedgehog who seem to be taking the class, while items such as a satchel, school tie, pen and quill and potions fill the reels with colourful images. It's got 5 reels and a fixed number of 25 paylines, with players able to choose wagers from as little as 0.25 per spin all the way up to 250.00 for a good range which will suit just about any bankroll. The control buttons are all designed to follow the theme, with crystal balls and magic potion bottles featured. The game itself has a blue and black colour scheme, with an intricate pattern forming a backdrop to the reels, while some colourful payline indicators to the sides show how each of the lines runs across the reels from left to right. Winning combinations are made when players land 3 or more of the same type of symbol across a payline, with the row needing to start from the left side, and the symbols needing to be on adjacent reels. On to the symbols themselves, and they are all related to the theme of a feline wizardry school, with none of the playing card symbols that so many pokies feature. The lower value ones are simply items that the students have brought in, or are using in their studies, with the first character we see being the hedgehog teacher, while other images include the school and the school crest. Higher wins come when the cats land across a line, with each of the 3 students being given a name and a few words about their personalities being detailed on the payout schedule. So we have Baz, Catrina and Leo, looking somewhat similar to Ron, Hermione and Harry Potter and at the top of the pile we find Dumbledore – sorry, Master Tom, who acts as a wild symbol and can pay out as much as 100,000 coins when he substitutes for the students to complete a line. There’s no separate value attached to the wild, and he can’t substitute for the lower value symbols, but to make up for this, he will multiply the value of any line he completes by 5x. Each of the 5 reels contains a letter from the word M-A-G-I-C, and the Magic Spell of the title could also refer to the bonus round that’s triggered when this word appears across the reels following a spin. The letters also act as a scatter symbol so if just 3 appear, players receive a prize that is calculated as multiplies of the total amount staked per spin, rather than just the line bet which applies to other wins. The letters don’t need to be across a payline, as they can be scattered around the reels and once they all land to make up the (literally) magic word, players are taken to the Secret Library Bonus Round where they will see 5 books laid out in front of them. All that’s needed is for the player to click on them in any order, and each book contains either a prize multiplier, a Win All reward, where all hidden prizes are paid out, or a game over message that takes them back to the reels. Magic Spell is an older pokie, first released in 2007, and in some ways it shows, with fairly basic cartoon images of the cats and their school. But they are all presented in a friendly cartoon style and the nice extras that come with this game have kept it popular since then. One thing that’s missing is a free spins round, while maybe it would have been nice to see the gamble game that so many pokies from this developer come with, but these are not major distractions from what is generally a quality game from one of the top companies in the business.